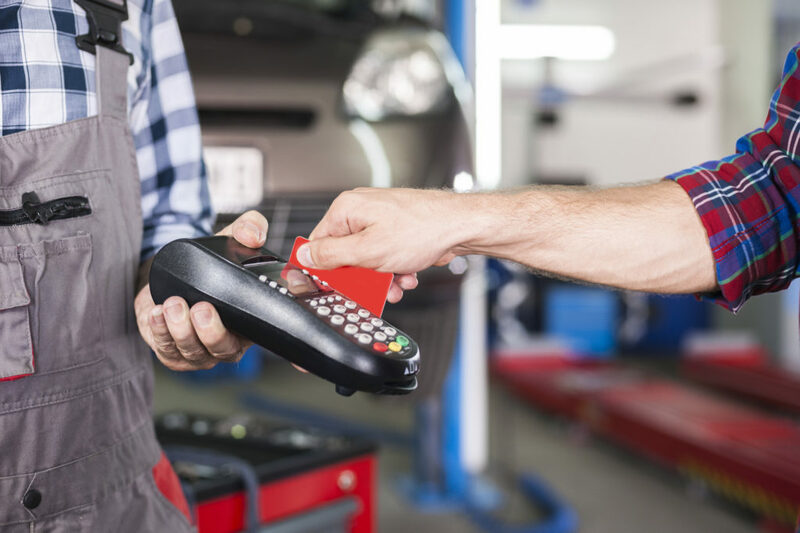 Editor’s note: Despite some insurers’ insistence that all collision repairers in a market should charge an identical amount, logic suggests different independent businesses are going to have different labor rates. Business 101 also suggests that body shop owners should adapt their rates to market conditions, just as insurers and suppliers do with their prices. In this guest column, National AutoBody Research President Sam Valenzuela offers some insight on how to evaluate your own shop’s labor rate for 2018. We’re well into the New Year, and many body shops use this time to consider changes to their labor rates. But for collision repairers, 2018 is distinctively different from prior years. A new reality of advanced, high-technology vehicles has arrived and dramatically changed the collision repair landscape forever. More than ever, proper labor rate pricing is crucial for body shops to sustain long-term profitability, growth, and prosperity. At NABR, we’ve been actively surveying, studying, and analyzing labor rates for quite some time now, enhanced through our Variable Rate System (VRS) software. After communicating with thousands of body shops and seeing firsthand how they make decisions about pricing their labor, we have some basic steps to share for anyone who wants to take action on their labor rates for 2018. First, let me provide some context. About 4,650 individual body shops nationwide have submitted labor rate surveys to us using our free survey. 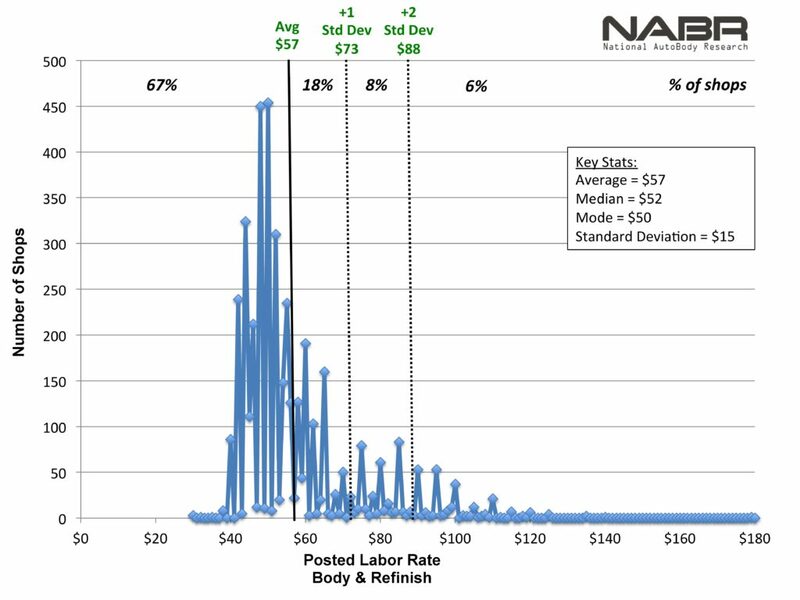 From that survey data, posted rates for body labor saw a national average of $57, and $88 at the +2 standard-deviation mark. New surveys submitted within the last twelve months show an average of $63 and a $98 upper bound of the +2 standard-deviation range. “Standard deviation” is a statistics calculation, and it measures a data point’s difference (or “deviation”) from the average. It tells us how tightly grouped together or how spread out the data is. When standard deviation is low, then the data is tightly grouped together, which means that most shops tend to charge similar rates. When standard deviation is high, then the data is spread out, which means that shops charge a greater variety of rates. 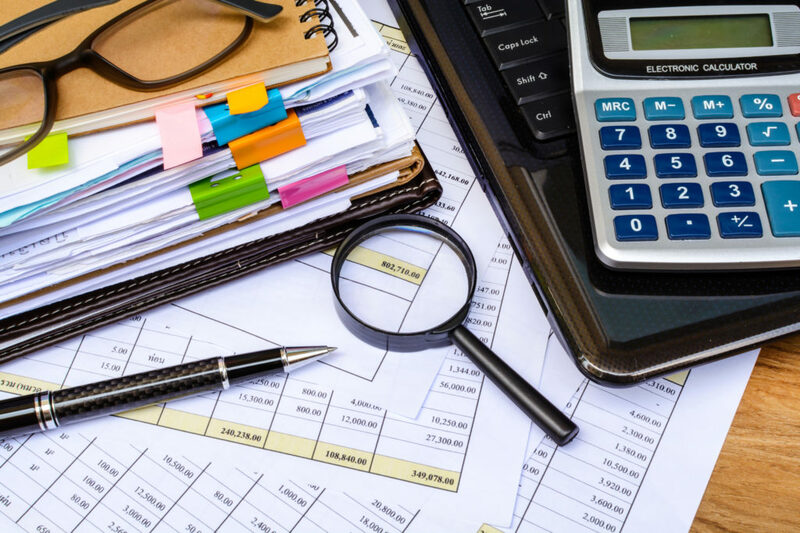 Doing a comprehensive labor rate analysis for your shop can be complex and quite involved, so instead, we offer here four simple steps to help get you on the road to finding the right price for your individual shop. 1. Consider your market’s overall cost of living. 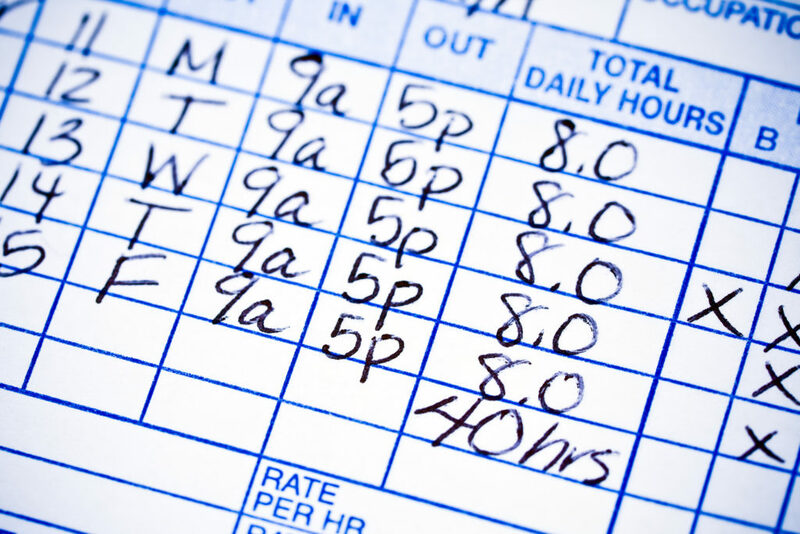 This can serve as a simple sanity check to help ensure your labor pricing is within a reasonable range for the area you operate in. While there is no official U.S. government cost of living index that compares the cost to live in different cities, there are some online resources that do. One is AreaVibes.com, which can give you a pretty good idea. For this index, the national average is listed as 100. The index number for your market represents the cost to live there as a percentage of that national average. For example: The cost of living index for Honolulu, Hawaii, is 181, meaning that it costs 181 percent of the national average to live in Honolulu. Based on the cost of living index alone, we might expect to see body labor rates in Honolulu with an average of $103 — $57 multiplied by 181 percent. Yet the survey data for posted body labor rates in Honolulu averages $55, below the national average and far below the cost-of-living-adjusted rates. As you can see, labor rates there appear misaligned with that geography’s cost of living. 2. Consider general consumer price inflation. This is simply the overall increase in prices of typical household expenditures. Inflation also erodes the purchasing power of money, as your dollars don’t go as far as they used to. In the U.S., inflation is measured by the Consumer Price Index (CPI) and is often used for cost of living adjustments (COLA), such as Social Security benefits. In 2017, the CPI rose 2.1 percent, driven largely by energy costs, especially fuel oil and gasoline. 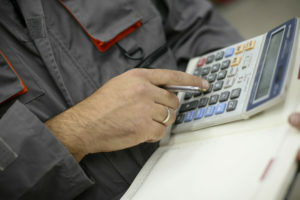 To help maintain purchasing power and keep up with the overall increase in cost of goods, a shop could consider making an inflation adjustment to its labor rates. For example: If a shop currently charges $57 per hour, adjusting the labor rate for last year’s approximate inflation would yield a price of $58.20 — $57 multiplied by 102.1 percent (57 * 1.021). Overall, our observation is that most body shops’ labor rates do not keep up with inflation over time, which puts those shops farther and farther behind every year, eroding their profits and purchasing power and risking their sustainability. Instead, we see body shops’ costs increasing at faster rates than inflation; paint costs alone could increase 3-8 percent per year, sometimes multiple times per year. We suggest shops think of keeping up with inflation as a minimum requirement, not a real solution to choosing their proper labor rate. 3. Consider what makes your shop different. Especially factors like training, equipment, facilities, and OEM certifications. Shops are not alike, and those that have made more investment in these items likely have greater repair capabilities than shops that haven’t. And they likely require a higher labor rate to pay back and earn a return on those investments. Use the VRS to find apples-to-apples comparisons for your shop and what price ranges are for shops similar to yours around the country. For example, our national survey data shows I-CAR Gold Class shops have body labor rates averaging $56; Assured Performance shops average $58, Audi OEM-authorized collision repair facilities average $65, and Mercedes shops average $64. 4. Consider what investments you need to make this year. How much money do you need to invest to improve your repair capabilities (especially for high technology vehicles), such as training, equipment, or earning OEM certifications? In general, your current labor rate only covers your current business. You likely need a new labor rate to cover new investments because your current rate was never priced to pay for them. Most body shop investments such as tools, equipment, and training are intended to make repair labor more skilled and effective. Equipment can’t repair a car by itself; it needs labor to put the equipment to use. The same goes for tools, facilities improvements, and certifications. Therefore, labor activity has the burden to pay off those investments plus earn a return. Let’s look at an example shop and investment: A shop needs to make a $5,000 training investment for a technician. The shop currently charges $57/hour for labor, has a 50 percent gross profit margin on labor, and wants to earn a 15 percent return on investment in one year for this training investment. The technician bills 2,000 hours per year and operates at 100 percent efficiency. The 15 percent return on investment is $750; that is, $5,000 multiplied by 15 percent (5,000 * 0.15). So the shop needs to earn back $5,750 (the $5,000 investment plus the $750 return) in one year. The shop decides to spread that cost evenly over the tech’s 2,000 billable hours, which calculates to $2.88 per hour. This is the additional amount per hour the shop needs to earn to pay back the investment in one year. Because the shop earns a 50 percent gross profit margin on labor, we divide the $2.88 by 50 percent to get $5.75. This is the additional amount that needs to be billed for each hour (via the labor rate) so that the shop earns the $2.88/hour profit it needs to pay off the investment and earn the return. Therefore, the shop’s current $57/hour labor rate plus the additional $5.75 equals $62.75, which is the new labor rate the shop needs to collect to pay for this $5,000 training investment and earn a 15 percent return. A similar analysis is needed for all the other investments in equipment, facilities, certifications, and ongoing training. It can add up quickly. But shops that don’t adjust their rates to fund these investments quickly eat into their profits. Given the rapid increase in technology in this industry, we can expect a large and continual investment required to keep up with the training and equipment necessary to repair these high-tech vehicles properly and safely. Mathematically, the industry’s current labor rates will only take a shop so far down that road before they are simply unable to afford the necessary investments. This leads to three major risks to shops: 1) lacking the knowledge to repair new high-tech vehicles; 2) putting consumer safety in jeopardy; and 3) putting themselves at legal risk by performing improper or unsafe repairs. You can also go deeper with a more thorough cost-of-doing-business analysis, examining competitive wage levels in your market, and determining your profit goals then backing into the labor rate needed to hit that goal. These require having a good handle on your financial statements and a good spreadsheet or calculator to help with the calculations. Also keep in mind that as unemployment in the U.S. continues to drop, wage levels will increase, and it could become more expensive to acquire new employees and retain good ones. Shops need a labor rate that can support paying competitive wages. If you find yourself choosing between two rates, we suggest erring on the high side to help stay ahead of the increasing wage curve. Remember, there is no rule that says you can only set your labor rates once per year. Prices can change at any time for any reason, and because markets and businesses are dynamic, labor rates can and do change continually throughout the year. We advise shops to consider their labor prices several times per year as their business evolves, cost structure changes, and investments are made. They can change rates as often as they need to. In conclusion, pricing your labor can often be more complex and more involved than this, especially considering all the investment needed to repair high-tech vehicles, but these simple four steps can help get you in the right range and closer to the right price for your individual shop. Sam Valenzuela is president of National AutoBody Research.